Creating online courses is huge business right now, and it's only going to get bigger. In fact, the world's largest research company, Research & Markets, estimates that the e-learning market is set to hit $331 billion by 2025. No wonder there's a ‘gold rush' of people wanting to create an online course and market their knowledge. But what all the exciting facts and figures don't show us, is those who created a course and then struggled to sell it. All the hopeful small business owners who poured months of hard work into creating their course (not to mention the investment of tech), only to find themselves back where they started from. Still trying to find customers. 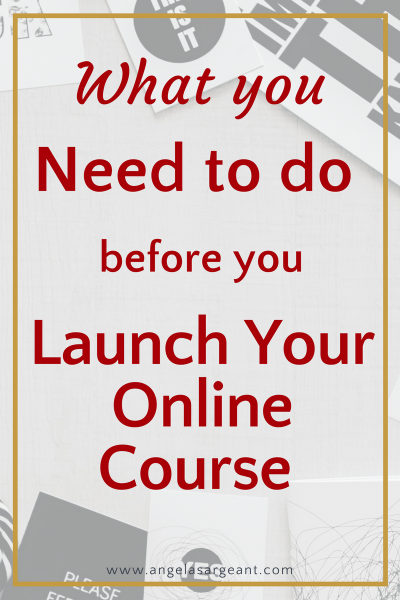 Today I'm going to uncover one essential thing you need to do before you launch your course, so you can maximize your chances of a successful launch. You've created a brilliant course. Check! People are absolutely buying online courses. Check! And they're definitely interested in your topic. Check! So how do you avoid getting to the end of a launch, without having hit your sales goals, and spending more money than you made? To sell your course, it's necessary not only to show people how your course will help them, but also why they should buy it from you. Before someone decides to buy your course, they subconsciously go through the process of deciding whether you are the one they trust to buy a course from. What people really want to be sure of, is that you understand them. And that you ‘get them' enough to be able to give them the solution to their problems, better than anyone else. If you've ever read an article or book about sales & marketing, you'll know that people buy from those they know, like and trust. Blogging, webinars, podcasts, videos. Any platform where you can show off your knowledge and expertise, is going to give your potential clients the confidence to know that you can help them. And while all those platforms are great for showing off your knowledge and your teaching style, you still want some more touchpoints for you to connect with your audience, and for them to warm up to you. You can't wait for your prospects to find the time to visit you on your blog, you need to be where they are. Of course you can bring them to you via your email list, but as I'll explain soon, that's still not enough to create that “know, like and trust factor” people need to feel before they invest in you. So now to get the message out to your audience. The days of “build it and they will come” have long gone. Once upon a time you could create a landing page, email your list and make some sales. But with the online world throwing us into information overload, there's no end of solopreneurs, infopreneurs, digital marketers and everyone else, jumping up and down online, vying for attention. This is actually a positive thing, because once you can differentiate yourself, and get your message across clearly, you can really stand out from the crowd. So what about your competition? Catherine Dove, Course Creation Expert at Digital Business Boutique explains that it's actually great news if there are courses being sold with the same topic you've chosen. This is because it shows there's a market for what you're selling. And I totally agree with Catherine. Everyone has their own special way of doing things, and their own experiences and knowledge to bring to the table. So someone else selling a similar service or product as you isn't an issue. After all, where would Bruno Mars be today if he decided “Michael Jackson has been there done that, I won't bother”. There's room for everyone to share their knowledge and talents with the world. The secret ingredient to capturing your market share, is differentiating yourself from the competition. It's also being able to express that difference to your audience so they recognize it, appreciate it, and feel connected to you. In effect, you are creating a warm audience. And it's having a warm audience that will increase your potential for selling, as people will be open to your sales message. Social Media is the perfect platform for you to express that differentiation, not only because there's so many ways you can do this on social media, but also because your audience is there and watching. The key is to ensure your distinct brand comes across in your social media marketing. This is where you can set yourself apart from everyone else online. This is how people will decide, even before you launch your course, that you are the one they want to do business with. And you are the one they trust to take them on their journey of learning. We've heard “the money is in the list” enough times to become obsessed with the size of our email list, especially at launch time. And that's usually when Facebook Ads come into the sales cycle to help build your mailing list. But while advertising helps build hype towards your launch, and your mailing list is where the gold lies. There's nothing like social media to create engagement before and after someone has signed up to your email list. Why? Because moving people to your email list after they've become fans on social media, means they'll be happy to hear from you. Your subscribes will open your emails because they already feel like they know you. They are closer to purchasing from you and they're happy to refer you to their friends because they feel a connection with you. That's a big difference from people signing up to your email list cold, and then forgetting where they heard of you when your next email pops up. The result of a cold email list is a higher un-open and unsubscribe rate. More important though than the size of your email list, is that your subscribers should already believe you understand their needs. Relying only on Facebook ads is a costly exercise if you're not consistently turning up for your audience where they're hanging out. This can be overcome by providing value and building your authority wherever your audience comes in contact with your brand. Again, this helps warm up your email subscribers, so they are more likely to open your emails next time they see them. While many people believe myths like ‘social media doesn't drive sales', the truth is, people buy because of social media. Your sales page might be a thing of beauty, and where people will ultimately click that “buy now” button. But people connect with other people, and social media is where you'll be able to provide that connection to support the buying process. Doing all these things consistently starting now, will give you a better chance at having a successful launch (or next launch) for your course. It will also help you have a steady stream of customers if your course is evergreen. Feel like you're already doing all this but you're still not getting results? Click here for a free 45 minute breakthrough session, where I'll take a look at one of your social platforms and pin point what's not quite working for you.